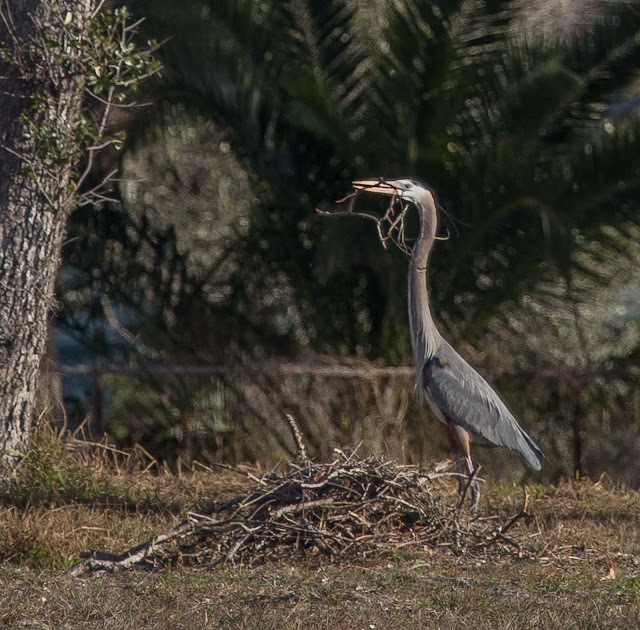 Recently local birders, including Sally Mitchell and Jane Willard, noticed that the birds beginning to nest at the Bent Oaks Rookery along Little Bay were having trouble finding nesting materials. 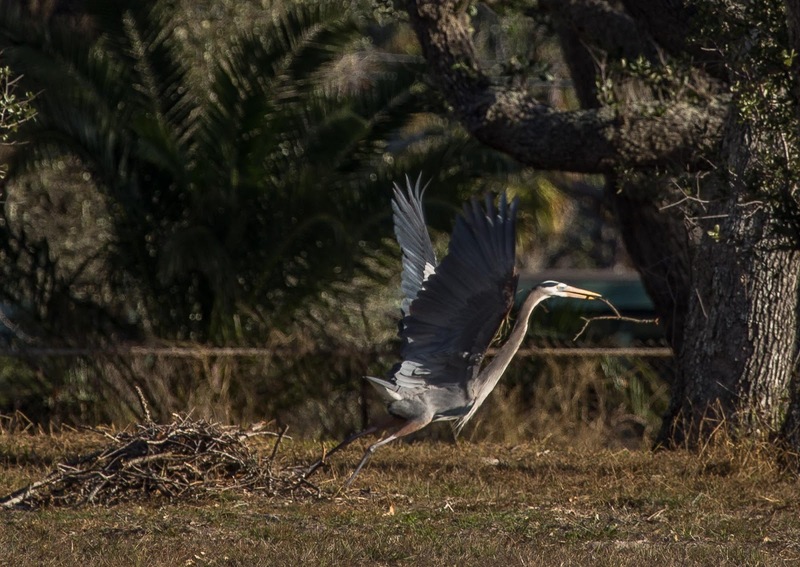 They observed the valiant attempts by herons, egrets, and other birds that were trying to gather twigs and branches to build their nests high in the oak trees. The birds would walk around and search the ground looking for just the right type of material. They would sometimes pick up a little twig, stick, or small branch, test it with their beaks, find it to be dead wood or otherwise unsuitable, and drop it because it was too rotten or weak for their nests. After searching everywhere, some would fly great distances to find what they needed. The problem? 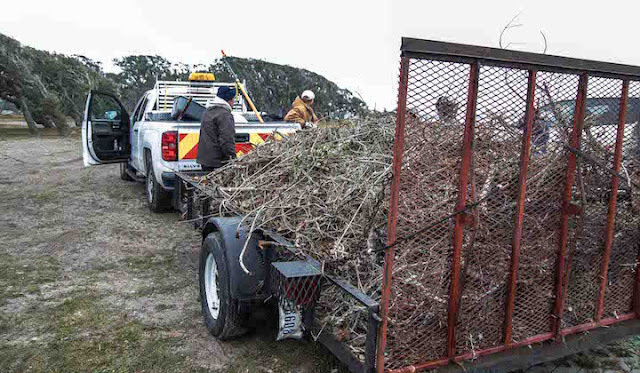 The City of Rockport's parks department had been a little too thorough in their post-Harvey debris cleanup and the area was cleared of needed material. In this case, perfection was heartbreaking. 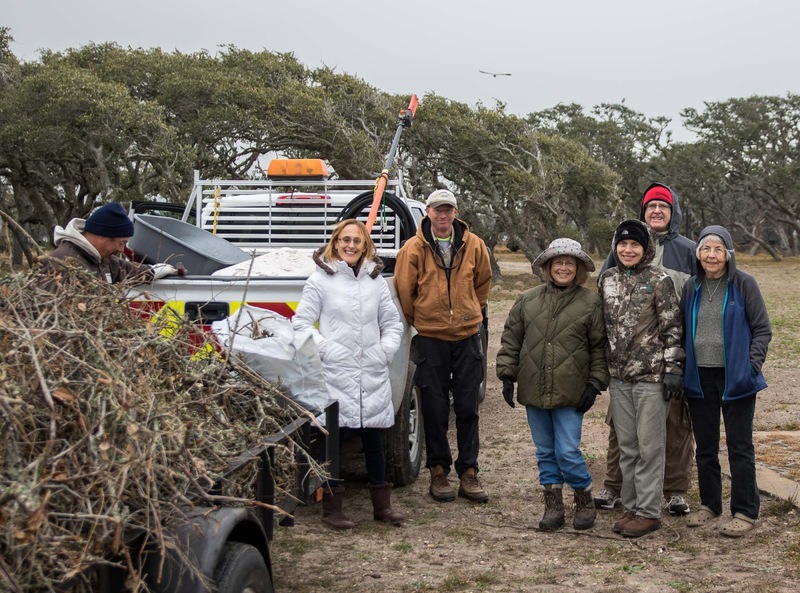 The problem was brought to the attention of Neli Spurrell with Keep Aransas County Beautiful, who contacted Debra Corpora, chair of the Aransas Bird and Nature Club. The question on everyone's mind was how to help the birds with their nest building. Debra and Neli contacted Park's Director Rick Martinez to get permission for a volunteer group to gather materials from other locations and scatter materials out under the trees. 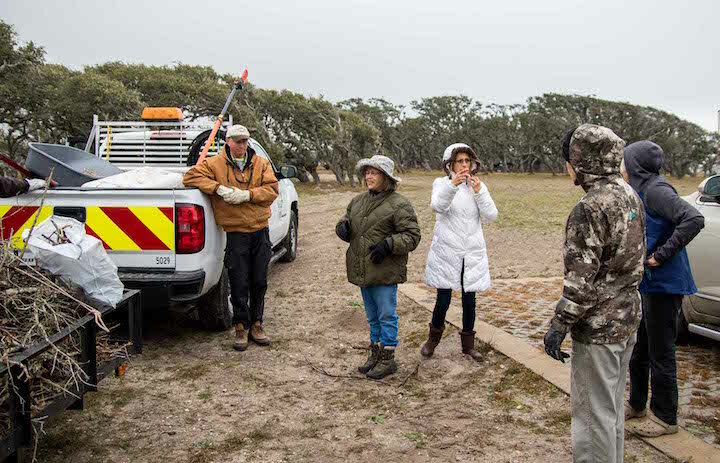 Corpora also consulted with David Newstead, biologist at Coastal Bend Bays & Estuaries Program (CBBEP) who confirmed that the survival rate for the colonial birds following the storm had been devastating. This added to the urgency to help our local birds rebuild their numbers. The nesting problem is even more critical because many of the smaller rookeries were decimated by the hurricane. "As huge as our Bent Oaks rookery is, there were many smaller rookeries out on each oyster reefs and islands. The small trees and bushes on the islands were essential for nesting herons, egrets, and spoonbills. While we are used to seeing our Great Blue Herons high in the oaks, but they are also successful in nests 6 feet above ground," according to Corpora. After the hurricane, teams from CBBEP found that every island they could locate was wiped cleaned of vegetation and platforms except for one small island that has a little bit of vegetation on it. After the storm, some platforms have been re-built on one island. Except for this small island and the Bent Oaks rookery, there is no place left for nesting. Re-vegetating the islands will take ten years and $1 million adding to the importance of Bent Oaks. Unlike migratory birds, many of our resident birds, including the herons, egrets, and spoonbills, did not fly away to safety before the storm. With so many local birds gone, colonial waterbirds up and down the coast are pushing each other around looking for nesting areas. 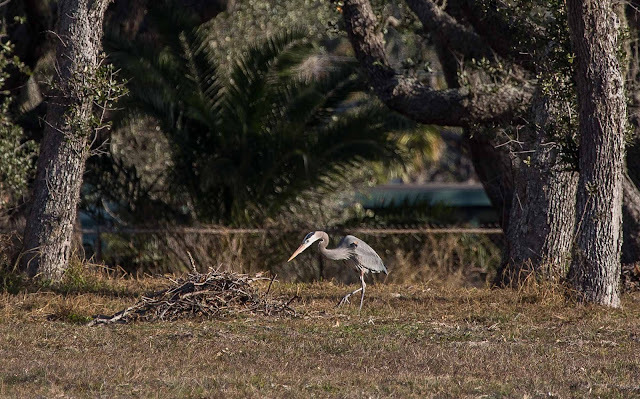 "Many of the birds, like the Great Blue Herons, we are now seeing in the oaks probably moved into our area from up and down the coast in the last few months." said Corpora. As they come here to nest, they need nesting materials. And this group of birders and the City of Rockport were able to help them! The group of interested birders met with the City of Rockport to come up with logistics to safely replace some of the twigs, branches, and other nesting material back to the property. The team also had to figure out how work in a way that minimized the impact on the birds. On Saturday, January 20, several loads of materials were carefully put in place and the birds almost immediately began using the imported materials to build their nests (see photo sequence). Residents and visitors are asked to stay behind the fencing, including areas where the fence is missing. Park across the street from the Bent Oaks, along Maple Street, and stay as far away as possible when observing the birds. Even just a few minutes of disruption can make the parents fly off, allowing predator birds to swoop in and attack eggs and chicks. Nesting has started and eggs will be laid from mid-January through August. Babies begin to hatch in mid-February. As they begin to fledge or we have spring storms, babies can easily fall out of the nests. Parents and people can not return the babies to the nest and babies are vulnerable to harm from predators and fire ants unless helped quickly. Anyone who observes babies on the ground are asked to contact Wings Rescue Center (WRC) immediately. Volunteers with Wings Rescue Center are trained and licensed to get the babies and raise them until they are old enough to be released. The success rate for babies that are rescued quickly is excellent, with most being able to be returned to the area. For help with injured or abandoned birds, call the WRC dispatch number, 361-205-0892, between 8:00 a.m. and 8:00 p.m.